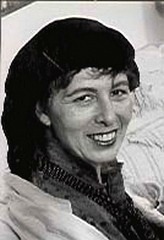 Noga Treves was born in Jerusalem and lives there today. She studied theater and English literature at Exeter University in England, dance in Vermont and creative writing at the University of Texas. A former dancer, Treves was a dance critic for a Jerusalem weekly and a staff member on the prestigious French magazine, Le Monde des Debats. At present, she teaches creative writing at the Hebrew University of Jerusalem. The Man in the Pink Raincoat, her first book, was awarded the 1990 Jerusalem Foundation Prize and the 1991 Kugel Prize.